Yesterday, the Standing Committee on Canadian Heritage released its Review of the Canadian Music Industry report, available at http://www.parl.gc.ca/Content/HOC/Committee/412/CHPC/Reports/RP6661036/412_CHPC_Rpt05_PDF/412_CHPC_Rpt05-e.pdf. The report gives an overview of the current state of the Canadian music industry, summarizes witness testimony on the five themes, and considers outcomes proposed by witnesses on each theme. The Committee recommends that the Government of Canada examine the time that it takes for decisions to be rendered by the Copyright Board of Canada ahead of the upcoming review of the Copyright Act so that any changes could be considered by the Copyright Board of Canada as soon as possible. The Committee recommends that the Government of Canada work with provincial authorities and other stakeholders to improve the musical knowledge and skills of Canadians. The Committee recommends that the Government of Canada work with stakeholders in order to launch an information campaign on the actual cost of creating music, the negative impacts of illegal downloading and the importance of respecting the intellectual property of music creators, with an outcome of assisting the music industry in terms of improved measures and initiatives related to these issues, including preventing piracy. The Committee recommends that the Government of Canada work with stakeholders from the Canadian music industry and the Canadian tourism industry to make music tourism in Canada a focus of marketing campaigns. The Committee recommends that the Government of Canada study the economic impact of introducing a tax credit to support the Canadian music industry, taking inspiration, if needed, from those granted to the film and television industries. The Committee recommends that the Government of Canada undertake a study of the impact of digital technology on the Canadian music industry and on government funding programs. 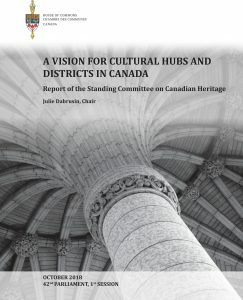 The Committee recommends that the Department of Canadian Heritage ensure that the various components of the Canada Music Fund reflect the changes in Canada’s music industry, including potential new sources of funding from the private sector, with special attention given to creators, entrepreneurs and independent producers. The Committee recommends that the administration of the Music Entrepreneur Component of the Canada Music Fund be transferred from the Department of Canadian Heritage to a new third-party organization(s) based on the model of FACTOR and Musicaction. The Committee recommends that the Department of Canadian Heritage ensure that the general public and recipients are aware that FACTOR and Musicaction funding is made on behalf of the Government of Canada. It is positive that the Committee recommends the government examine the time it takes for decisions to be rendered by the Copyright Board of Canada ahead of the upcoming review of the Copyright Act. Numerous witnesses, including Music Canada, identified the length of time for decisions to be rendered by the Board as a cause of uncertainty in the legal landscape and a deterrent to progress. As the report notes, a dozen witnesses identified insufficient resources as a reason the rate-setting process is so lengthy. We support providing the Copyright Board with the proper tools, personnel and financing to function more as a business development office, as well as Parliament allowing rights holders and digital services to do deals directly at fair market value. We are very pleased to see the Committee recognize the importance of music education to all Canadians. As the report notes, the positive effects of music education came up repeatedly during the Committee’s study, with several witnesses urging support for music education as it fosters critical thinking, imagination, self-esteem, and self-discipline, assets which are useful in an economy based on information technology and communications. It is gratifying to see our Next Big Bang report cited on this point in the report. We are supportive of the Committee’s recommendation that the government work with stakeholders to develop information campaigns on the value of music, the negative impacts of illegal downloading, and the importance of respecting the intellectual property rights of creators. We would be very happy to work with the government in developing these campaigns. We are very pleased to see the Committee recommend the study of introducing a tax credit to support the music industry, taking inspiration, if needed from the existing tax credit system for film and television industries. The development of artists is a form of R&D and is deserving of public support, similar to the tax credits available in other R&D-intensive industries. The Committee requests that the government table a comprehensive response to the Report. The report has the support of the three main parties, with some additional recommendations made by the New Democratic Party and the Liberal Party. In particular, the Liberal complementary report suggests more comprehensive changes to Copyright Board based on testimony from witnesses. Music Canada urges the government to support the findings of the report and looks forward to working with the government on implementing its recommendations. Music Canada is looking forward for an opportunity to address the committee on themes as explored in The Next Big Bang, A New Direction for Music in Canada. For reference, links to witness appearances and transcripts are below, and we will update this page following future appearances. Department of Canadian Heritage: Jean-François Bernier, Director General, Cultural Industries; Sophie Couture, Director, Music Policy and Programs. Society for Reproduction Rights of Authors, Composers and Publishers in Canada: Alain Lauzon, General Manager. Connect Music Licensing: Victoria Shepherd, Executive Director. Alliance of Canadian Cinema, Television and Radio Artists: Brad Keenan, Director, Recording Artists’ Collecting Society; David Faber, Canadian Musician, Faber Drive . Association québécoise de l’industrie du disque, du spectacle et de la vidéo (ADISQ) : Solange Drouin, Vice-President of Public Affairs and Executive Director. Canadian Independent Music Association: Stuart Johnston, President; Shauna de Cartier, Chair. Music BC Industry Association: Robert D’Eith, Executive Director. Canadian Music Publishers Association: Elisabeth Bihl, Executive Director; Jodie Ferneyhough, President. Society of Composers, Authors and Music Publishers of Canada: Gilles Daigle, General Counsel and Head of Legal Services. Professional Music Publishers’ Association: David Murphy, President. Library and Archives of Canada: Hervé Déry, Acting Librarian and Archivist of Canada, Office of the Librarian and Archivist of Canada; Cecilia Muir, Chief Operating Officer, Office of the Chief Operating Officer. Canadian Radio-television and Telecommunications Commission: Scott Hutton, Executive Director, Broadcasting; Annie Laflamme, Director, Radio Policy and Applications. Alliance nationale de l’industrie musicale : Natalie Bernardin, President; Benoit Henry, Chief Executive Officer. Songwriters Association of Canada: Greg Johnston, Vice-President; Jean-Robert Bisaillon, Vice-President. Gospel Music Association of Canada: Martin Smith, President. Volu.me: Shawn Cooper, President and Co-Founder. SiriusXM Canada: Andréanne Sasseville, Director, Canadian Content Development and Industry Relations; Paul Cunningham, Vice-President. Songza: Vanessa Thomas, Managing Director, Canada. As individuals: Brett Kissel; Louis O’Reilly, Manager, O’Reilly International Inc.